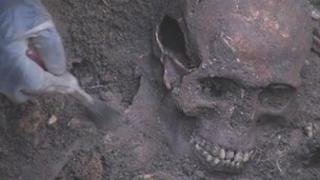 The skeletons 18 people have been unearthed at a mass medieval burial site near Durham Cathedral. At first archaeologists thought the remains were part of the cathedral's cemetery but then realised they had been "tipped" into the ground. They were found during work on Durham University's Palace Green library. Experts believe the people may have been killed by disease and were buried in a hurry, but said it was too early to say. Richard Annis, senior archaeologist at Durham University, said: "We have found clear evidence of a mass burial and not a normal group of graves. "The bodies have been tipped into the earth, one on top of each other, without elaborate ceremony and they are tightly packed together and jumbled. "Some are buried in a north to south alignment, rather than the traditional east to west alignment that we would expect from a conventional medieval burial site." His team must get permission to move the bones from the UK's Ministry of Justice before it can begin trying to determine how old they are. By law the remains must eventually be reinterred in an approved burial site. Mr Annis added: "The process of post-excavation processing, examination and analysis is essential to allow us to draw proper conclusions about this group of human remains. "It is too early to say what they may be."